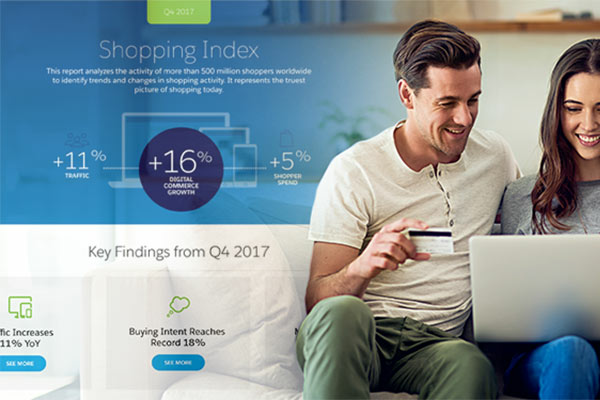 The Q4 digital commerce numbers in our Shopping Index are out, and they reveal plenty of seasonal boosts for the defining three months of the retail year. Here in the UK, sighs of relief are echoing all round as growth returns after a stagnant few quarters. UK retailers saw overall traffic climb 9% in Q4, year on year, mostly thanks to mobile which saw a 21% traffic increase. Order growth bounded even further ahead. There was a 6% increase in the last three months of 2017, comparing very favourably with the 5% sag in orders seen in Q4 2016. And, as seen with traffic growth, it was mobile that was the driving force - leaping by 29%. All this is very welcome after the last three quarters of slowing momentum here in the UK. But cast your eyes to the global picture and the UK's Q4 numbers somewhat pale in comparison. Worldwide traffic growth notched up an impressive 11% boost, and order growth posted a superb 17% surge. There's no such lagging behind for the UK when it comes to intent, however. In fact, UK shoppers revealed the most impressive buying intent in two years. The 22% of shoppers showing strong inclinations to purchase, pipping the 18% so-inclined, globally. And when it comes to intent becoming act, there's been a 25% increase in those shoppers completing their buy, comparing Q4 2017 to Q4 2016. Interestingly, while intent in both the UK and the wider world is similar across platforms when it comes to platform preference, mobile continues its relentless rise. Two-thirds of digital commerce traffic (67%) now comes courtesy of mobile phones in the UK. Order share for mobile also posted another increase in Q4 to 40%, within snapping distance of the 42% of orders clicked through on our computers. So why is mobile winning? The great fit for delivering a personalised shopper experience might be the answer. Those who can deliver the benefits of friction-free transactions, site recognition and ease-of-search functionality on mobile look set to reap the rewards. Tellingly, all of these are being driven by ever more ubiquitous AI. Growth may be back, but it's not without some pain. Signs that margins are being squeezed are revealed by the numbers on discounting in the Q4 report. Average discount rates were close to a quarter-mark-down, globally, as the year drew to a close. That's up from Q4 discounts reported for 2015 and 2016. Meanwhile, free shipping peaked at 73%. Those trends were mirrored in the UK numbers, although at the slightly lower levels of 18% average discount rate and 69% reported free shipping. There has to be some concern as to where the creeping up of discounts will take retailers. Could it end up with them seeing their brands significantly devalued? There are many more questions, and even more fascinating answers, to be found in our interactive drill-down of our Q4 Shopping Index. The data gathered on 500 million digital shoppers, from such key markets as the US, Canada, Germany, France and Australia/New Zealand (as well as the UK), makes for a rich source of insight and trend.